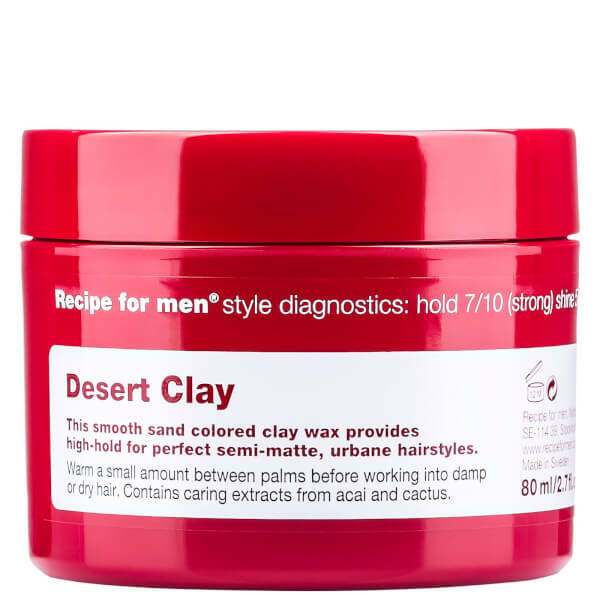 Sculpt your style with the Recipe for Men Desert Clay Wax, a soft, sandy-coloured hair wax that expertly holds locks in place. Infused with the conditioning properties of Acai and Cactus, as well as moisturising Beeswax, the lightweight formula offers a firm, flexible hold and a semi-matte finish. Hair is left defined, strengthened and healthy. Petrolatum, Cera Alba, Diatomaceous Earth, Isopropyl Myristate, Aqua, VP/VA Copolymer, Polysorbate 20, C12-13 Alkyl Lactate, Parfum, Glycerin, Limonene, Phenoxyethanol, Euterpe Oleracea Fruit Extract, Opuntia Coccinellifera Flower Extract, Potassium Sorbate, Sorbic Acid.